Here we name Califostoma (type species Purpura turris Nomland, 1916) as a new genus of ocenebrine muricids from the Pliocene of California. There are two species: Califostoma turris and Califostoma rotundivaricosum new species, from the Pliocene of central and southern California. These species are distinguished from other ocenebrines by irregularly placed varices, and ribs that extend to the siphonal protuberance intersected by spiral cords, creating deeply incised rectangular sculpture. These species likely represent the northern ancestors of Crassilabrum crassilabrum (Gray in G.B. Sowerby II, 1834), known from the Pliocene to Holocene of Peru and Chile. The variable growth in Califostoma may be adaptive for inconsistent environmental conditions in contrast to species of Ceratostoma, which form varices at regular growth intervals. Type locality: El Rancho Del Rey, San Diego Formation, San Diego County, California. Fifteen species of Muricidae are listed from Papua New Guinea. Six new deep water species are described: Conchatalos samadiae spec. nov., Nipponotrophon barbarae spec. nov., Scabrotrophon manai spec. nov., Scabrotrophon maranii spec. nov., Scabrotrophon puillandrei spec. nov., Scabrotrophon maestratii spec. nov. Eight other species listed are new records. The genus Enixotrophon is used, based on geographical congruence and Pagodula obtusa Marshall & Houart, 2011, Pagodula procera Houart, 2001, and Trophon pulchellus Schepman, 1911, are transfered to it. The previously accepted synonymy of Trophon johannthielei Barnard, 1959, with T. pulchellus is questioned. The variability of Scabrotrophon inspiratus Houart, 2003 is redefined as well as its spiral cord morphology. Type locality: Papua New Guinea, stn CP3743, off Woodlark Islands, 09°11’S, 152°16’E, 540-585 m [BIOPAPUA: stn CP3743]. Type locality: Papua New Guinea, off Bougainville Is., 05°04’S, 154°29’E, 662 m [BIOPAPUA: stn CP3755]. Type Locality: Papua New Guinea, east Kotakot, 04°19’S, 145°37’E, 1000-1045 m [PAPUA NIUGUINI: stn CP4039]. Type locality: Papua New Guinea, southeast of Tuam Island, 06°03’S, 148°08’E, 440-475 m [PAPUA NIUGINI: stn CP4006]. In this paper we review the Muricidae of the Zanclean lower Pliocene assemblage of Le Pigeon Blanc, Loire-Atlantique department, which we consider the ‘type’ locality for Assemblage III of Van Dingenen et al. (2015). 14 species are recorded, of which 2 are new: Hexaplex (Trunculariopsis) ledoni spec. nov. and Ocinebrina lauriatrageae spec. nov. Murex lineatus Millet, 1865 is considered a junior homonym of Murex lineatus Gmelin, 1791 and replaced by Favartia milleti nom. nov. Ocinebra erinacea var. minor Harmer, 1914 is considered a junior subjective synonym of Murex subcontabulatus Millet, 1854. The muricid assemblage has a far stronger thermophilic character than seen at the latitude of north western France today and we suggest that average Sea Surface Temperatures off the NW French coast in the Zanclean lower Pliocene may have been warmer than they are at these latitudes today, possibly similar to those found today off the southern Portuguese coasts. Locus typicus: Le Pigeon Blanc, Le Landreau, Nantes area, Loire-Atlantique department, NW France. Stratum typicum: Zanclean, lower Pliocene. Locus typicus: Le Landreau, Le Pigeon Blanc, Loire-Atlantique department, NW France. Twelve species of Favartia Jousseaume, 1880 from the Indo-West Pacific are discussed and illustrated. Three additional species are described as new: Favartia bractea spec. nov. from southern Madagascar with occurrences in South Africa and Réunion, Favartia aporema spec. nov. from Mozambique and Favartia pseudosalmonea spec. nov. from Western Australia, a species that has long been identified as Favartia salmonea (Melvill & Standen, 1899). The new species are compared with related species, all of them illustrated in this paper. Favartia dorothyae Emerson & D’Attilio, 1979 is synonymised with F. salmonea (Melvill & Standen, 1899) (new synonymy) and a lectotype is selected for F. salmonea. Another lectotype is selected for Murex nucula (Reeve, 1845). The illustration of F. natalensis (E.A. Smith, 1906) by Fair as the lectotype is accepted as valid and the illustration of F. sykesi (Preston, 1904) as holotype by the same author is also considered as a valid lectotype designation. Type locality: Western Australia, Cleaverville Beach, Nickol Bay, 20°39’S, 117°1’E, low tide. Type locality: Mozambique, Nacala, intertidal, stones. 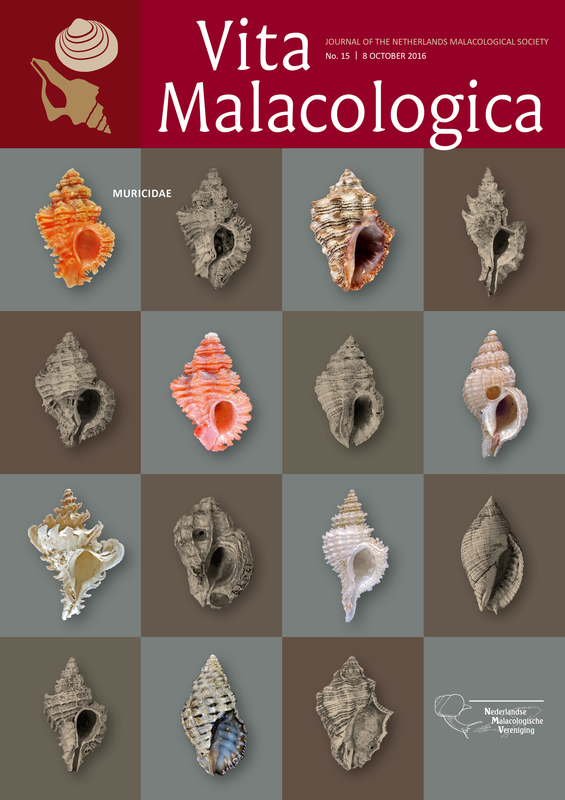 Type locality: Southern Madagascar, Ehoala harbour, fine sand, algae and Clypeaster, 25°03.5’S, 46°57.8’E, 7-9 m.
New material from NW Borneo further clarifies the differences between Taurasia and Preangeria, their habitat, distribution and fossil record. Taurasia occurs in shallow water rocky environments. It has a single extant species in the West Pacific which occurs since the Miocene, and five extinct species in Europe. It is demonstrated that Taurasia pendopoensis Beets, 1985 has a labral tooth, belongs to the genus Preangeria and is a synonym of Tritonidea praeundosa Vredenburg, 1924; Preangeria praeundosa (Vredenburg, 1924) is introduced as comb. nov.. Preangeria is restricted to deep water soft bottom environments. It has a single extant species and four or five extinct species in SE Asia. In addition comments are added on the species of Semiricinula from Borneo where the genus is represented by four extant species, some of which have been present since the Miocene, and one additional species which is herein attributed to Orania.